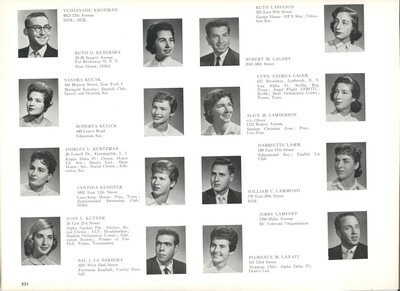 Senior Class: Yeshayahu Kronman, Ruth D. Kubersky, Sandra Kulak, Roberta Kulick, Shirley L. Jurtzman, Cynthia Kushner, Joan L. Kutner, Sal J. La Barbera, Ruth Labinson, Robert M. Lagary, Lynn Andrea Lager, Alice M. Lamberson, Harriette Lamm, William C. Lammond, Jerry Lampert, Florence M. Lanati. Brooklyn College -- Students -- Periodicals., College Yearbooks.